One of the weaknesses of traditional headwear is that it doesn't permit you to wear a hat and a pair of sunglasses the way you want to because the brim of the hat always interferes with the rims of your sunglasses. You can't pull the hat down as far as you would like to. Until now, there wasn't a better alternative than just putting up with the push and shove match between your hat and sunglasses. We took a very common problem and came up with the most practical, attractive solution possible. Our patented technology effectively eliminates the interference that commonly occurs between your hat and your sunglasses. It works with most wrap-around style sunglasses, shooting glasses and safety glasses. The war between your hat and sunglasses is over. 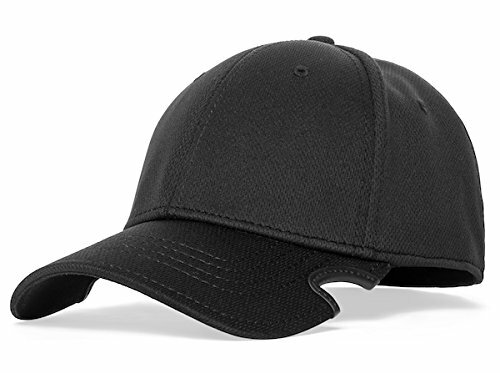 The Notch Classic Stretch Fit Black Blank Cap has no logo on the front so you can customize it. The options are endless! If you have any questions about this product by Notch, contact us by completing and submitting the form below. If you are looking for a specif part number, please include it with your message.